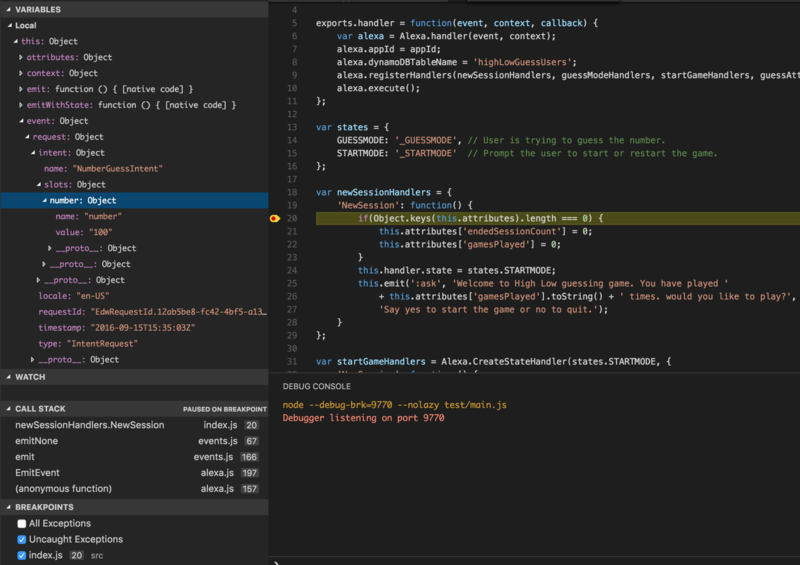 In this post, Nathan Grice, Alexa Smart Home Solutions Architect, shows you how to reduce skill development time by debugging your skill code in an local environment. Learn how to step through your code line by line while preserving roles and AWS services, like DynamoDB, used in the skill when running in AWS Lambda. Share your thoughts and feedback in this forum thread. 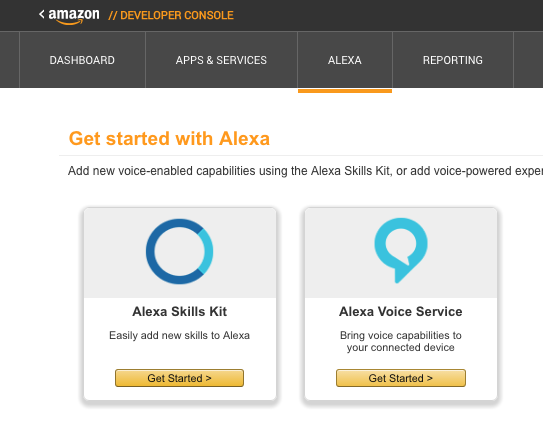 Amazon Alexa and the Alexa Skills Kit (ASK) are enabling developers to create voice-first interactions for applications and services. 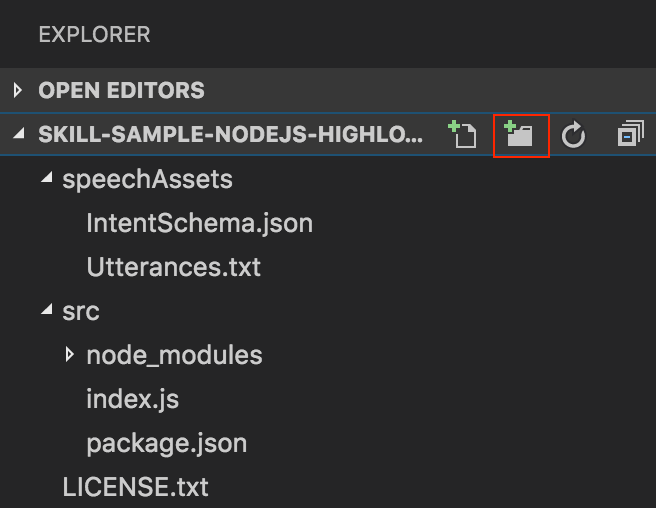 In this article, we will cover how to set up a local development environment using the Amazon Web Services (AWS) SDK for NodeJs. 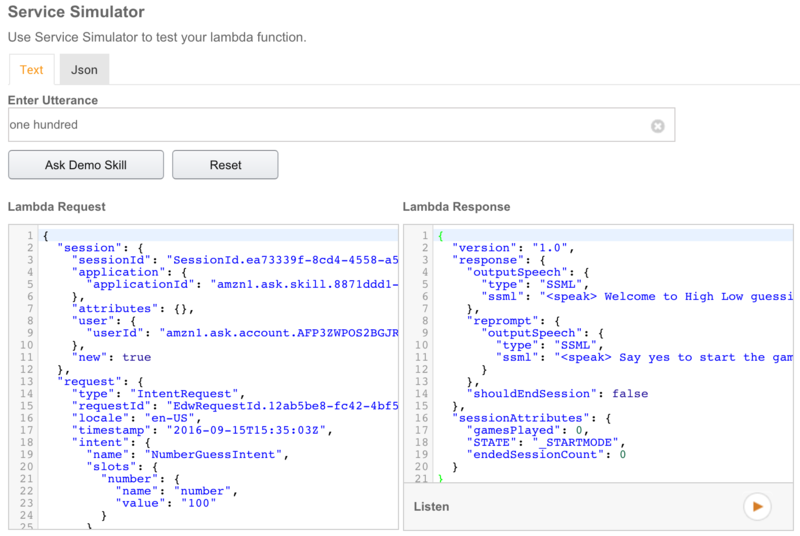 By following this tutorial, you’ll be able to invoke your AWS Lambda code as if were called by the Alexa service. This will also allow you to interact with any other AWS services you may have added to your skill logic such as Amazon DynamoDB. 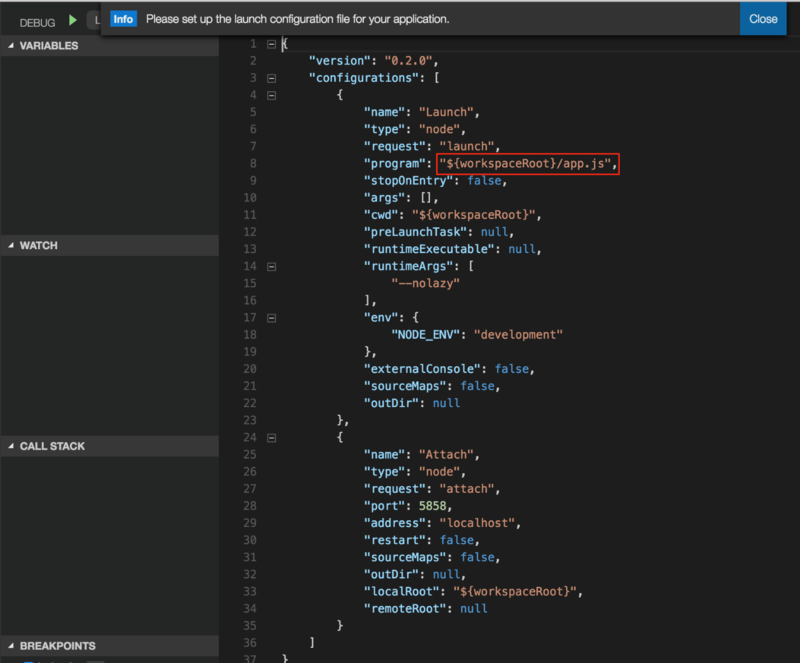 By the end of this post, you will be able to execute and debug all of your Alexa skill’s Lambda code from your local development environment. Using the aws-sdk, you should also be able to call any dependent services in AWS as if the skill code were executing in AWS Lambda by leveraging AWS Roles. This way, you can be sure your code is working before deploying into AWS and hopefully decrease the cycle time for applying new changes. For example, you want to persist something about users in a DynamoDB table and the only way to do this was run your code in Lambda. After this tutorial, you should be able to write to the remote Dynamo table from your local environment. First, let’s take a look at why you would want to streamline this process. The first time I developed a skill, I was not using an integrated development environment and almost all debugging information was obtained through log statements. This presents quite a few challenges from a developer’s point of view. Extra cycle time for adding functionality and logging to analyze the state of the program at any given moment. Uploading the new code to AWS Lambda is manual. 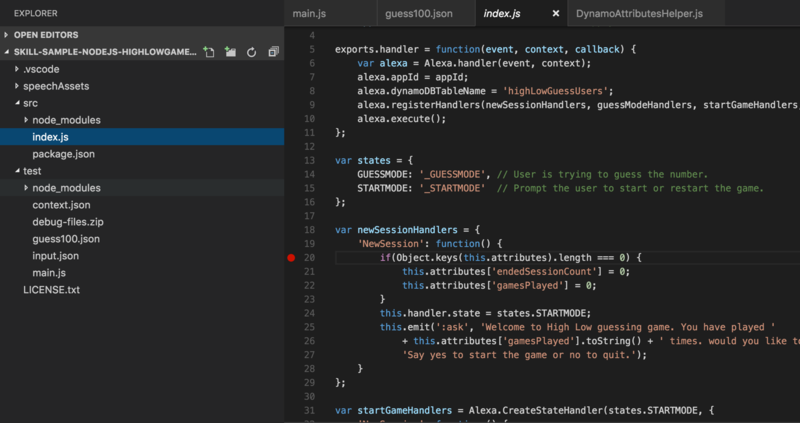 Testing the code using various methods was cumbersome, including manually constructing an event in AWS, persisting as a test event, using the developer console, or by invoking my skill on my own Echo or Alexa-enabled device. Analyzing Amazon CloudWatch logs was taking too long to effectively iterate features. I wanted a better way to execute and debug my code, but not lose any of the functionality of being constrained to a local environment. 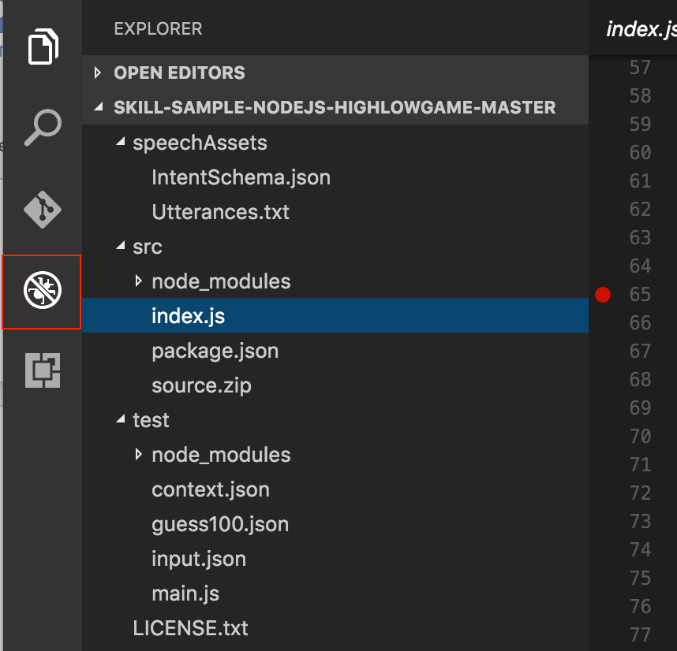 In the next section we will look at how to setup a local environment to debug your AWS Lambda code using Node,js, Microsoft's Visual Studio code open-source editor, and the aws-sdk npm package. 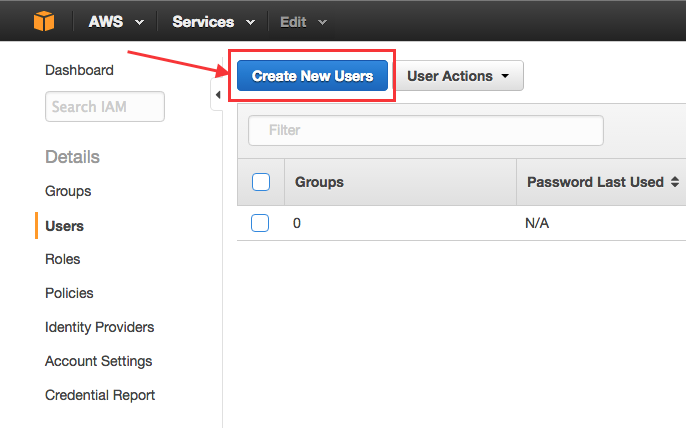 This tutorial will cover setting this up using Node.js but the AWS SDK is available for Python and Java as well. 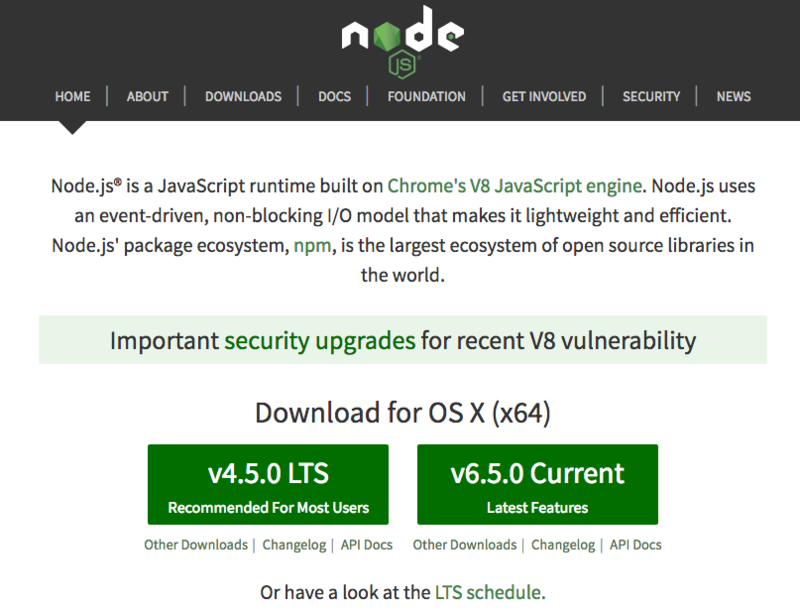 Install Node.js via the available installer. The installation is fast and easy, just follow the available prompts. For the purposes of this tutorial, I am on OSX, so I selected v4.5.0 LTS. 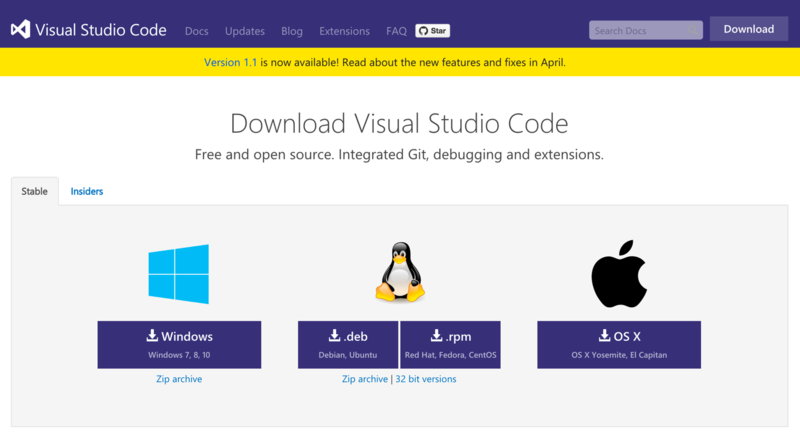 There are versions available for Windows and Linux as well. 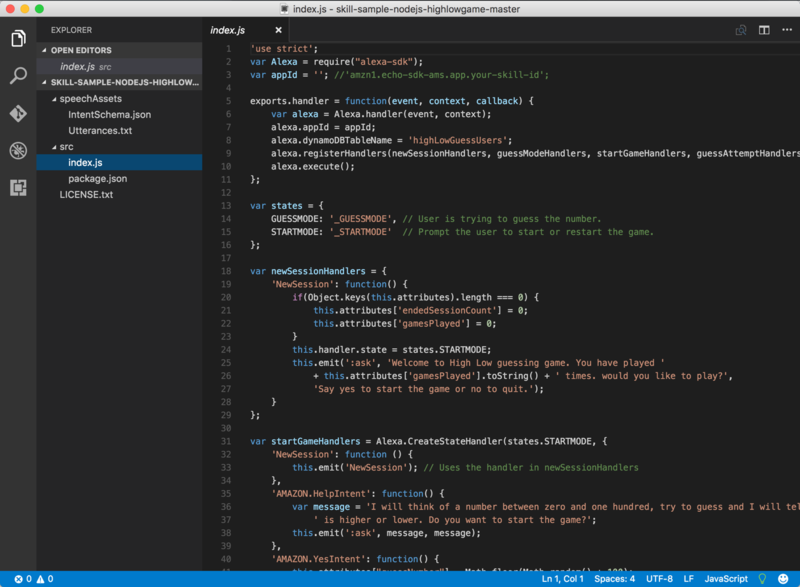 Repeat the process with Microsoft's Visual Studio Code. 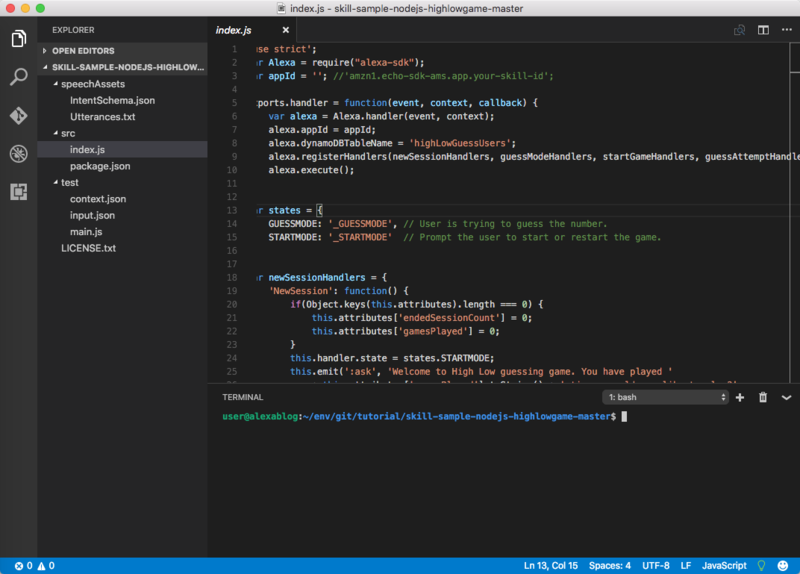 For the purposes of this tutorial, I am using Microsoft’s Visual Studio Code but others should work as well. 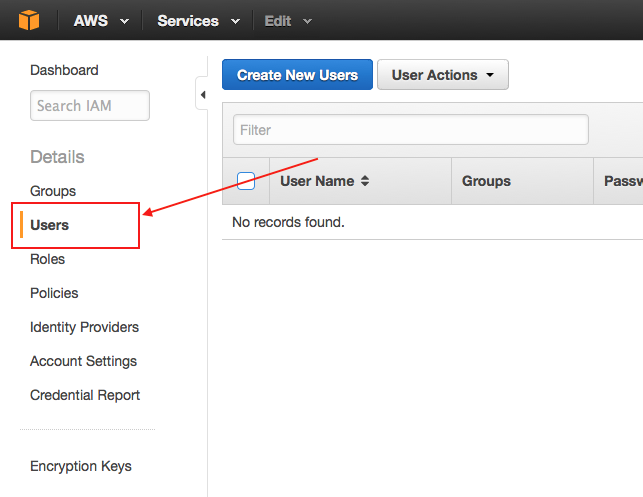 Follow the instructions in this guide to get the AWS cli set up on your environment. That's all you will need to get started. Next we will load our Alexa project and setup the IDE to debug the Lambda code. For the purposes of this tutorial, we are going to use the High-low guessing game template from the public GitHub repo for Alexa. 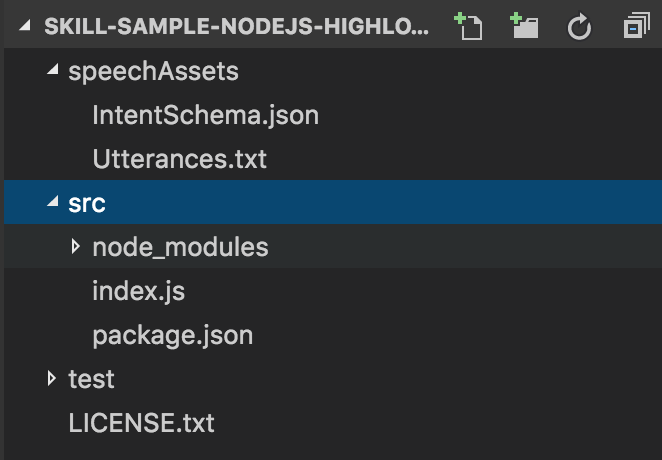 and a new directory in your project called src/node_modules. 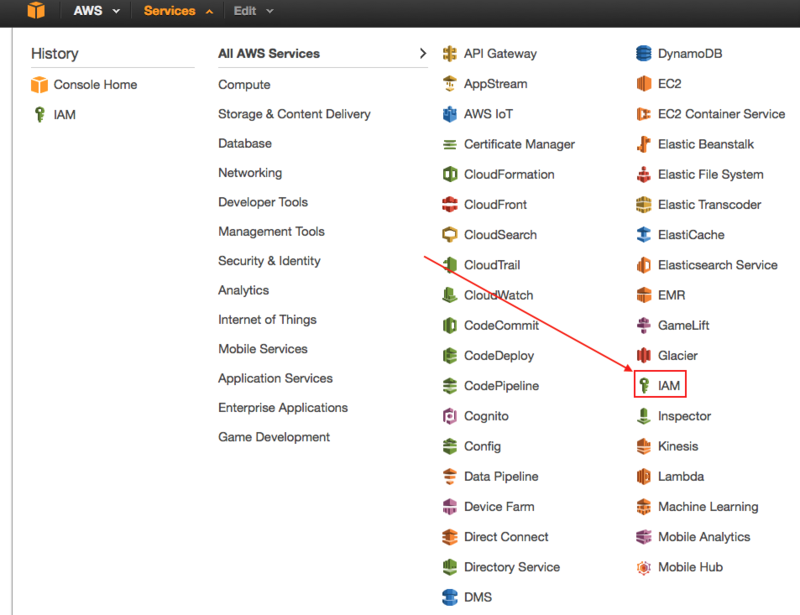 Note how we installed alexa-sdk package in the source directory for our skill code. This is important as to keep test files and modules out of the zip file uploaded to AWS Lambda. Currently AWS Lambda does not have the alexa-sdk module built in, you will need to upload it as part of your Lambda function source code. To add a folder, hover over the root of the tree view in the left pane and click the New Folder button. 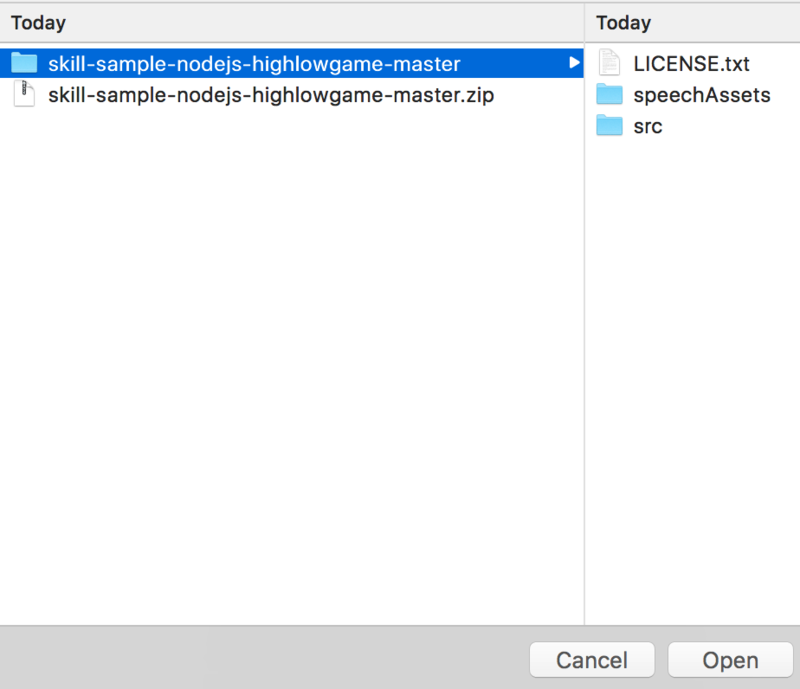 Note, if you had the src and speechAssets directories expanded, make sure to collapse the tree view and click the root directory of the project. It should look like the image below. Just make sure the test directory is under the root of the project and not a child of the src folder. If you are on a Windows machine, you’ll need to select the LICENSE.txt file and then click the icon to create the folder. Name the directory test and the resulting view should look like the following. Now, let’s add some code to these new files. You can ignore some of the values defined in these files for now. We will configure them for your project later in this tutorial. // Copyright 2015, Amazon Web Services. 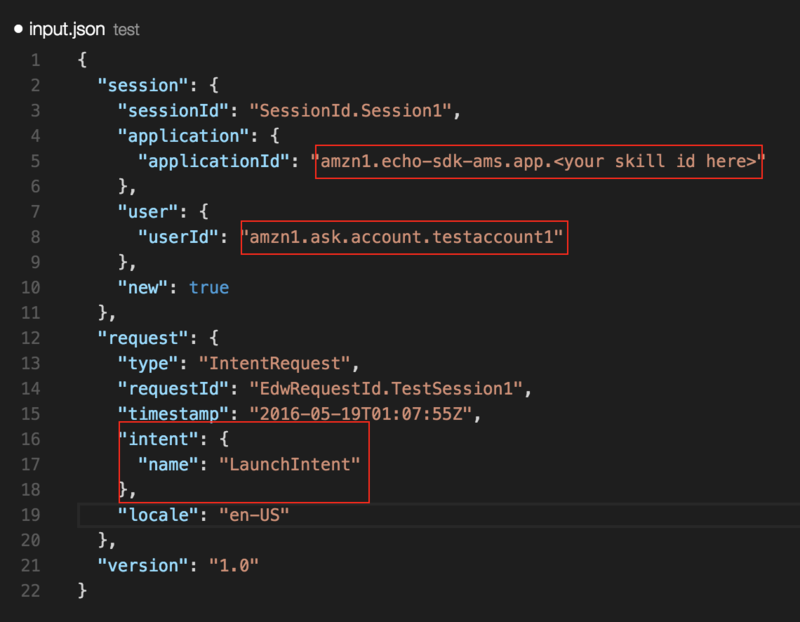 // "lambda.amazonaws.com" and "arn:aws:iam::<YOUR ACCOUNT ID>:user/<YOUR USER>"
"applicationId": "amzn1.echo-sdk-ams.app.<your skill id here>"
Next we will need to configure permissions on your local environment to assume the role used in the Alexa service. Note: The Alexa service has specific permissions to call this service. 3. 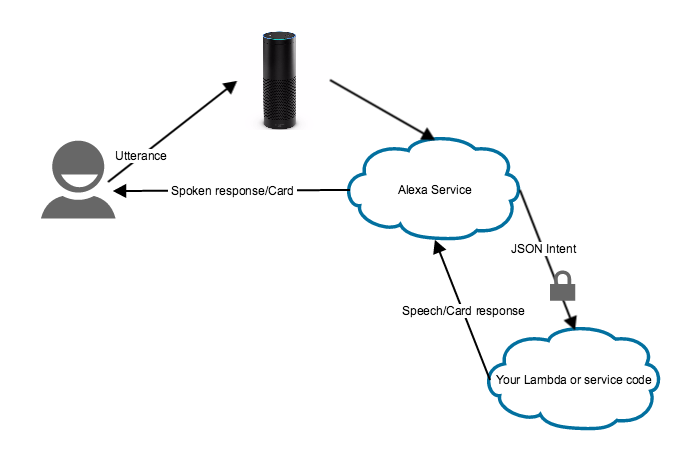 The Lambda returns speech text in a JSON response along with an optional card to the Alexa app. 4. The Alexa service routes the responses and speaks the response to the user. If you haven’t created a role used by your skill or haven’t created the Lambda function leveraging that role, please see the guide on the Alexa GitHub page. 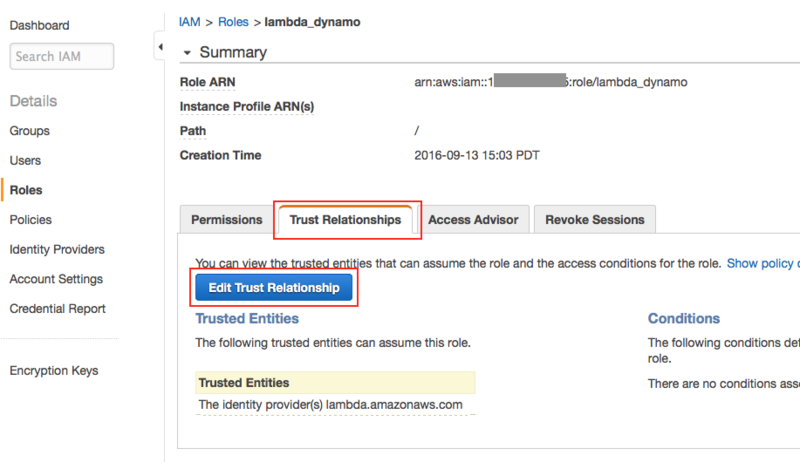 For the purposes of this tutorial, I created a role called lambda_dynamo that has the CloudWatchFullAccess and AmazonDynamoDBFullAccess policies attached. 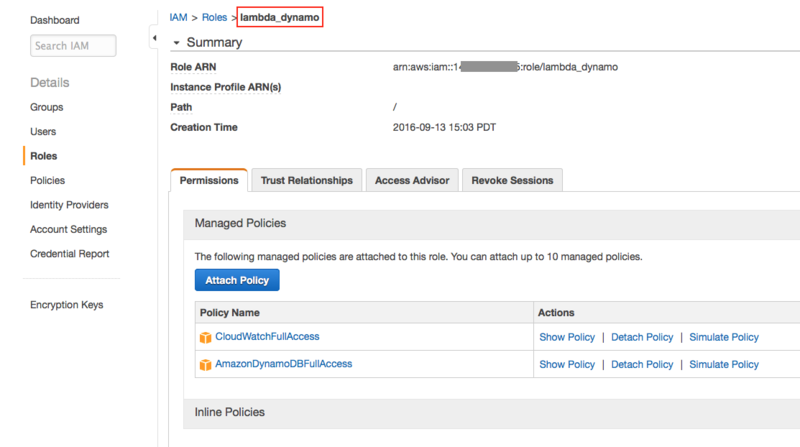 Since this is the role the Lambda function will inherit when invoked, these two policies ensure that the Lambda function can write to the cloudwatch logs and read/write to DynamoDB. This is the role I defined in my Lambda function for its execution role. 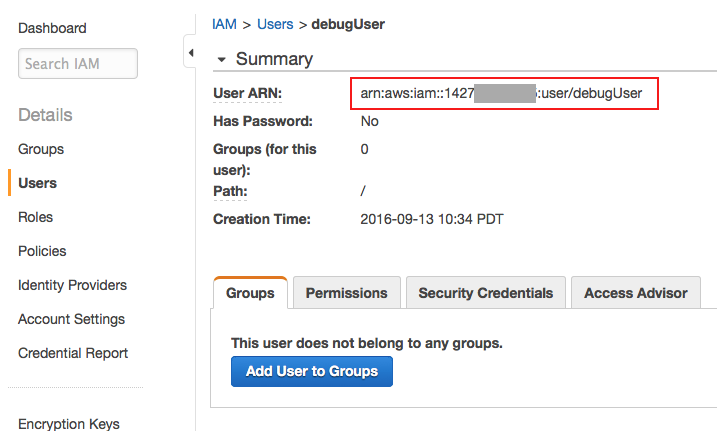 Let’s step through the process of creating the new IAM user and adding the right policies. To start, go to your AWS console and if you don't have a user created already, let’s create one specifically for debugging your Lambda function. Copy the User ARN field, you're going to need it in a minute. 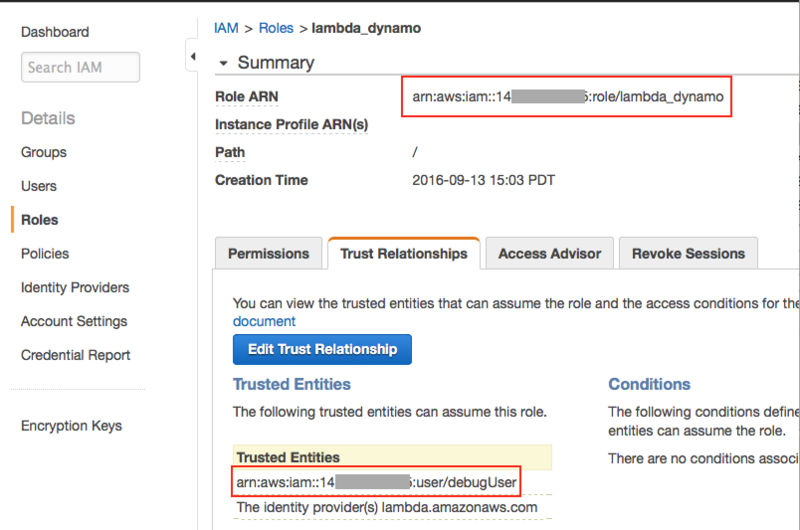 The Assume Role policy in AWS IAM gives a user the ability to inherit the execution role of your Lambda function. We will need to add this policy to the user you just created. 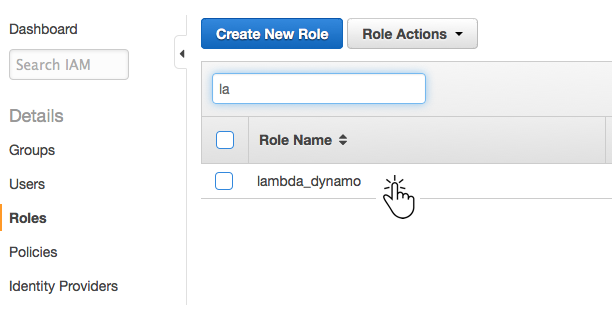 Click the Roles menu item on the left menu and select the lambda_dynamo role used for this example if you created the same or select the role your Lambda function is using. Click the Update Trust Policy button. In my example below, I already had the user configured so the default values were preset with <enter>. 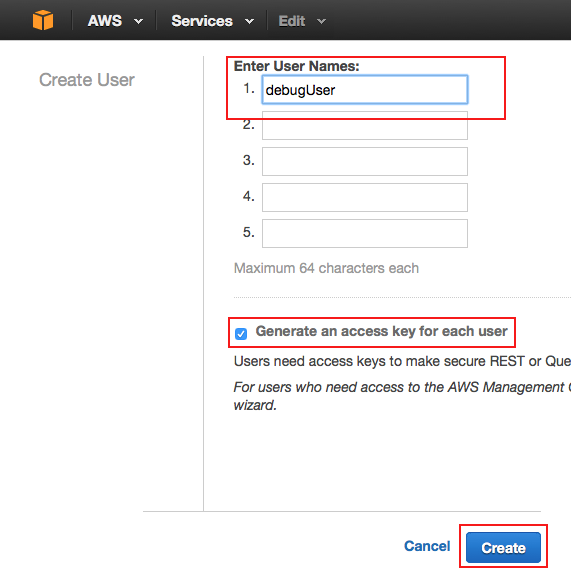 If this is the first time configuring the user, copy and paste the values captured when you created your IAM user and saved the AWS Access Key ID and AWS Secret Access Key. Let’s take a look at how you modify those for your skill. This value does not need to be a special value and can be created on the fly, but know that this is how Alexa identifies accounts enabled on the Alexa device. If you are storing values specific to a user, you will want to change this value in different scenarios to simulate different users. For more information about the request format and the userId value, you can visit our ASK reference page. The most basic case for your skills should be the LaunchIntent. This will test whether your skill code is being invoked correctly. In the sample the value for request.intent.name is LaunchIntent and is by default mapped to the launch intent handler of your Alexa skill. You can leave this alone to test basic functionality, but you are probably going to want to test real intents with real values. Let's look and see how you would do that. Different content for input.json means the ability to programmatically test each intent hander in your code. But manipulating this content every time you want to test a new function would be tedious. It would be nice to be able to regression test these by running through a suite of input.json files. The developer console has some information on using the built-in test feature of the skill console, but let’s take a closer look and see how it can be used to our advantage. This means some of the example phrases we can use to invoke this intent that would match the previous example (notice how the numbers are spelled out). For the purposes of this tutorial, let’s assume you assigned an invocation name of number guesser. The full phrase a user might say to an Alexa device would be “Alexa, ask number guesser is it one hundred. The Service Simulator does not require the wake word (Alexa) or the invocation words (ask number guesser) to simulate the invocation. Let’s enter the words “is it one hundred” and see what happens. NOTE: This section does not apply if you have not created the skill in the developer console. Access to the Service Simulator is through a defined skill. 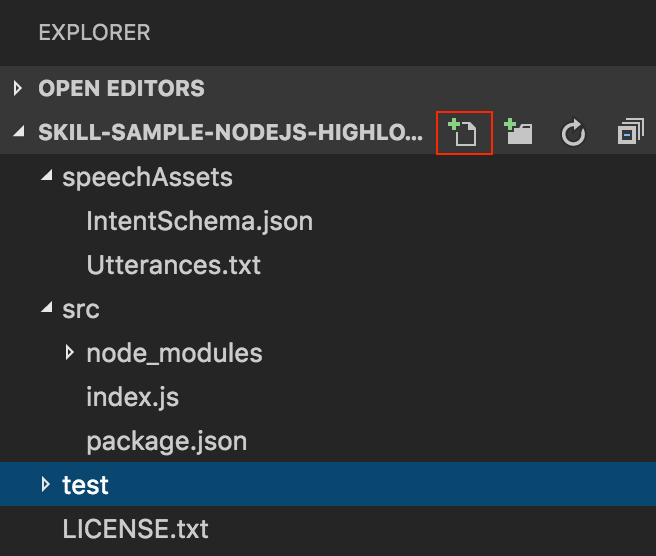 To switch between tests, you just need to edit the test/main.js file and change input.json to whatever file you want. There is a file for creating a context for your Lambda function. For the purposes of this tutorial, we are not passing any meaningful data to the lambda in the context, but it is needed to create the context object in test/main.js. 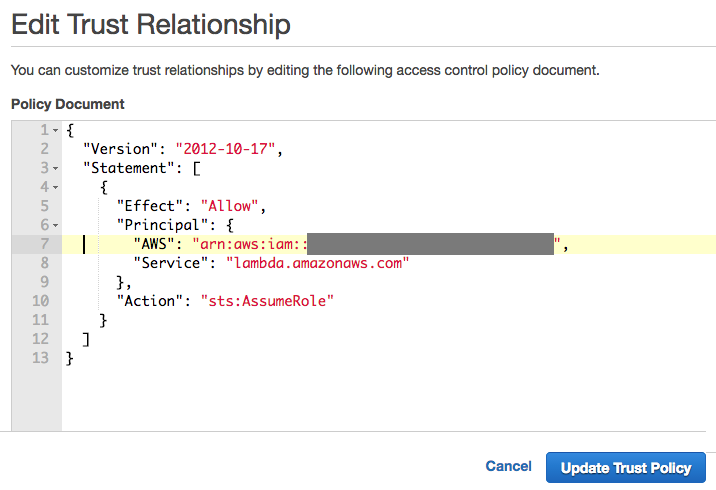 For more information please see the Context Object in the AWS documentation. Open up the skill code you want to debug, in this example src/index.js contains the business logic for the sample skill. To set a breakpoint, click to the left of the line number in the editor view. In this example, I set a breakpoint on the line 21. When we fire the test event test/guess100.json, this code should be executed. We only need to make one change to launch and debug at this point. Change the value for 'program' to match the main.js file in your test dir. Save the file. 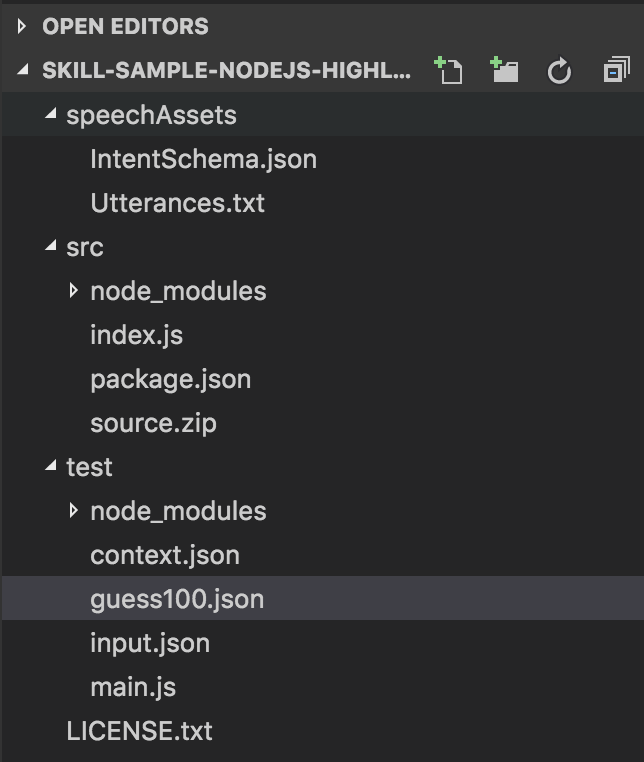 In the screenshot below, you can see that the debugger stopped on our breakpoint and the correct test/guess100.json file was passed into the intent object from the local variables view. 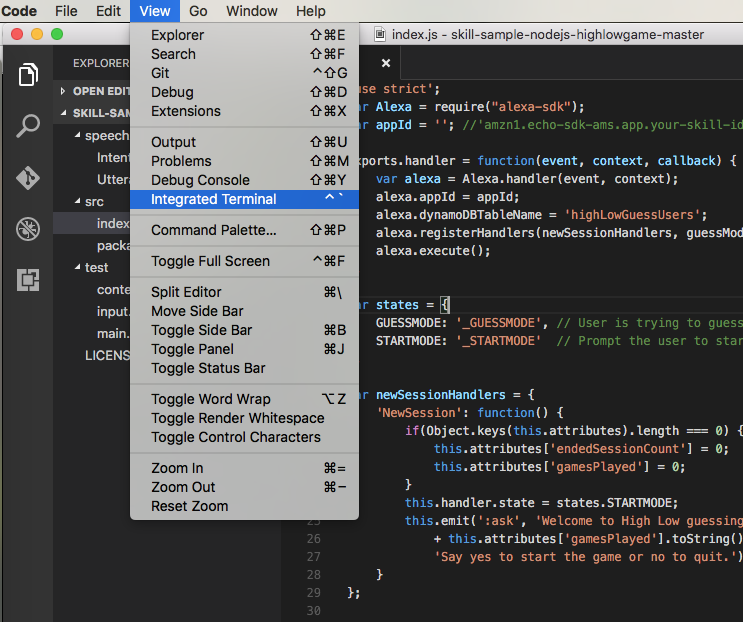 You can use the normal step-into, step-over, and step-out debugger functions to appropriately dive into your code and the state of any of the objects. 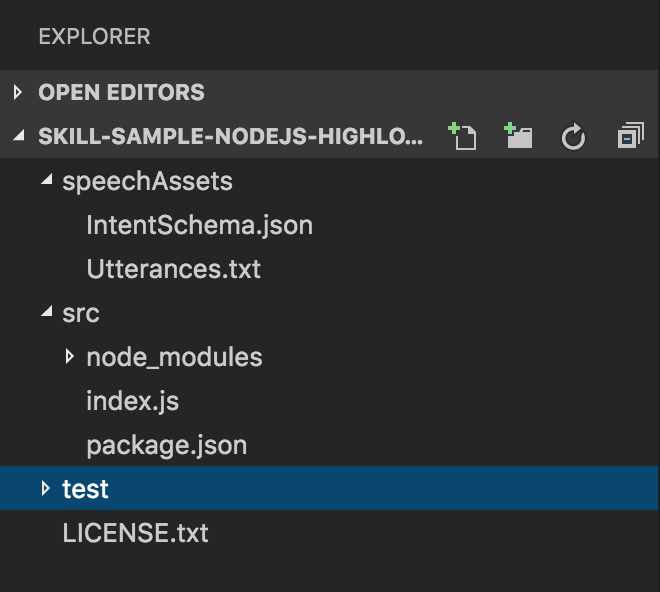 In this tutorial we demonstrated how to setup a local environment for the Lambda code of your Alexa skill written in Node.js, how to create a test user in AWS and assign the Assume Role policy to that user so it can inherit the same execution role defined for a Lambda function, create and store various input files to test the different intents implemented in your code, and set breakpoints in those intents to step through the code. 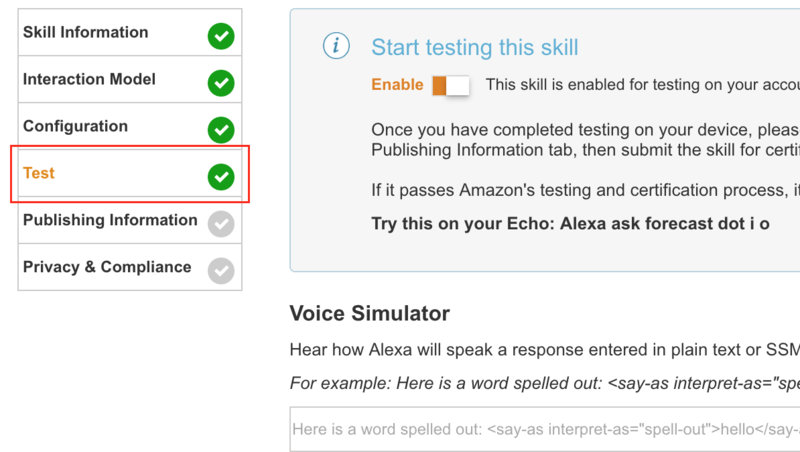 This strategy can be used to interact with other AWS services by applying the same Assume Role relationship to your test user for the various roles used in Alexa and AWS. For next steps, take a look at Josh Skeen's post on Developing Locally to understand how to use a promise framework to put unit tests and build automation into your project.